Abba Poemen teaches us that we should be careful not to undertake efforts too great for us. This gives the proper perspective in relation to the efforts praised in selections 3 and 4 above. It is better to make slow and steady progress with moderate efforts than to become discouraged or to miss the goal altogether with efforts too great for us. The following sayings of the Holy Fathers of the desert put the discipline of fasting in the proper perspective. As the true masters of fasting, they, more than any other Christians, are the ones who can best teach us its true nature. A leader of a community asked Abba Poemen: “How can I gain the fear of God?” Abba Poemen replied: “How indeed can we gain the fear of God when we have bellies full of cheese and jars of salted fish?” Abba Poemen thus teaches us that the ultimate goal of fasting is to help lead us, or to open us, to the fear of God. Another old man came to see one of the Fathers, who cooked a few lentils and said to him: “Let us say a few prayers,” and the first completed the whole Psalter, and the brother recited the two great prophets by heart. When morning came, the visitor went away, and they forgot the food. Fasting here witnesses that the true nourishment of Christians is prayer and meditation on the word of God, not the eating of food. A brother was hungry early in the morning, and he fought his desire so as not to eat before the third hour. When the third hour came, he forced himself to wait until the sixth hour. At that time he broke his loaves and sat down to eat, then stood up again, saying to himself: “Now wait until the ninth hour.” At the ninth hour he said the prayer and saw the power of the devil like smoke rising from his manual work, and his hunger vanished. It was said of an old man that one day he wanted a small fig. Taking one, he held it up in front of his eyes, and not being overcome by his desire, he repented, reproaching himself for even having had this wish. Fasting in both of these cases is the spiritual effort which establishes the spirit over the flesh. Abba Joseph asked Abba Poemen: “How should we fast?” And Abba Poemen said: “I myself think it’s good to eat every day a little at a time so as not to get full.” Abba Joseph said: “Well, when you were young, didn’t you used to fast for two days at a time?” And the old man said: “Believe me, indeed I did, for three days, and even a week. But the great elders tried all of this, and found that it is good to eat every day a little less each time. In this way, they showed us the royal highway, for it is light and easy.” Abba Poemen teaches us that we should be careful not to undertake efforts too great for us. This gives the proper perspective in relation to the efforts praised in selections 3 and 4 above. It is better to make slow and steady progress with moderate efforts than to become discouraged or to miss the goal altogether with efforts too great for us. It was said about an old man that he endured seventy weeks of fasting, eating only once a week. He asked God about certain words in the Holy Scripture, but God did not answer him. Then he said to himself: “Look, I have put in this much effort, but I haven’t made any progress. So now I will go to see my brother and ask him.” And when he had gone out, closed the door and started off, an angel of the Lord was sent to him, and said: “Seventy weeks of fasting have not brought you near to God. But now that you are humbled enough to go to your brother, I have been sent to you to reveal the meaning of the words.” Then the angel explained the meaning which the old man was seeking, and went away. Along with fasting there must be humility! Fasting opens the way; it is a means to an end; it is not the end itself. I myself once harshly judged a monk whom I saw drinking milk during the Great Fast. He did it so routinely that I thought, “Why, he must think nothing of the ascetic life.” It was I who had forgotten the rule of the inner life — that one judges himself and excuses others. I later learned that the monk was ill and had to have milk to ingest his medication. I learned something about hasty judgments. Here we learn that we must never judge another person. “The way of the active life consists in fasting, abstinence, vigils, prostrations, and other bodily practices, which constitute the narrow and painful way that leads, according to the saying of God, to life eternal” (Matt. 7:14). When the fast makes its appearance, like a kind of spiritual summer, let us as soldiers burnish our weapons, and as harvesters sharpen our sickles, and as sailors order our thoughts against the waves of extravagant desires, and as travelers set out on the journey towards heaven. Lay hold of the pathway which leads towards heaven, rugged and narrow as it is. Lay hold of it, and journey on. I speak not of such a fast as most persons keep, but of real fasting; not merely abstinence from meats, but from sins as well. For the nature of a fast is such that it does not suffice to deliver those who practice it unless it is done according to a suitable law. So that when we have gone through the labor of fasting we do not lose the crown of fasting, we must understand how and in what manner it is necessary to conduct the business since the Pharisee also fasted, but afterward went away empty and destitute of the fruit of fasting. The Publican did not fast, and yet he was accepted in preference to him who had fasted in order that you may learn that fasting is unprofitable unless all other duties accompany it. Fasting is a medicine. But like all medicines, though it be very profitable to the person who knows how to use it, it frequently becomes useless (and even harmful) in the hands of him who is unskillful in its use. For the honor of fasting consists not in abstinence from food, but in withdrawing from sinful practices, since he who limits his fasting only to abstinence from meats is one who especially disparages fasting. Do you fast? Give me proof of it by your works. If you see a poor man, take pity on him. If you see an enemy, be reconciled with him. If you see a friend gaining honor, do not be jealous of him. And let not only the mouth fast, but also the eye and the ear and the feet and the hands and all members of your bodies. Let the hands fast by being pure from plundering and avarice. Let the feet fast by ceasing from running to unlawful spectacles. Let the eyes fast, being taught never to fix themselves rudely on handsome faces, or to busy themselves with strange beauties. For looking is the food of the eyes, but if it be such as is unlawful or forbidden, it mars the fast and upsets the whole safety of the soul. But if it be lawful and safe, it adorns fasting. For it would be among things most absurd to abstain from lawful food because of the fast, but with the eyes to touch even what is forbidden! Do you not eat meat? Feed not upon lasciviousness by means of your eyes! Let the ear fast also. The fasting of the ear consists in refusing to receive evil speakings and calumnies. It is written, “You shall not receive a false report” (Exodus 23:1). Let the mouth also fast from disgraceful speech. For what does it profit if we abstain from fish and fowl and yet bite and devour the brothers and sisters. The evil speaker eats the flesh of his brother and bites the body of his neighbor. Because of this Paul utters the fearful saying, “If you bite and devour one another take heed that you are not consumed by one another” (Gal.5:15). You have not fixed your teeth in his flesh, but you have fixed your slander in his soul and inflicted the wound of evil suspicion, and you have harmed in a thousand ways yourself, him and many others, for in slandering your neighbor you have made him who listens to the slander worse, for should he be a wicked person, he becomes more careless when he finds a partner in his wickedness. And should he be a just person, he is tempted to arrogance and gets puffed up, being led on by the sin of others to imagining great things concerning himself. Besides this, you have struck at the common welfare of the Church herself, for all those who hear you will not only accuse the supposed sinner, but the entire Christian community…. And so I desire to fix three precepts in your mind so that you may accomplish them during the fast: to speak ill of no one, to hold no one for an enemy, and to expel from your mouth altogether the evil habit of swearing. For as the harvester in the fields comes to the end of his labors little by little, so we too if we make this rule for ourselves and in any manner come to the correct practice of these three precepts during the present Fast and commit them to the safe custody of good habit, we shall proceed with greater ease to the summit of spiritual wisdom. And we shall reap the harvest of a favorable hope in this life, and in the life to come we shall stand before Christ with great confidence and enjoy those unspeakable blessings of which, God grant, we may all be found worthy through the grace of Jesus Christ our Lord, with whom be glory to the Father, and to the Holy Spirit unto ages of ages. Amen! Cavarnos, C., and M.B. Zeldin, (1980). 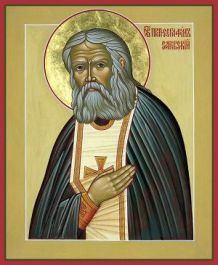 Modern Orthodox Saints: St. Seraphim of Sarov. Belmont, MA: Institute for Byzantine and Modern Greek Studies, pp. 94-95.